Temptations wear us down. They gnaw at us; they irritate us. Sometimes they even overwhelm us. As Catholics, our duty is to mortify each and every evil desire or thought that comes our way. It is a life-time occupation (this mortification of the senses and the will): we will not be free from temptation to sin until we have journeyed beyond this present life and are “safely home” in the “bosom of the Father.” It is wonderful to reflect on the fact that in Heaven there will be no sin! In Heaven we will be “singularly attracted” ever-more to the Infinite Goodness of our tender Father: and since God is infinite there will ever be “fresh and new motives” for loving God throughout all eternity! Shall we not – as Father Faber says – throw a little sunshine on our temptations? Must they always be so dreary and vexing to us? Can we not see the great good that comes to us when we resist temptation by trusting in God and resting in His grace? Do we expect victory to come to us without trials and struggles? “We know well that one additional degree of sanctifying grace is of more price than all the magnificence of the universe. The objects upon which we often fasten our affections, or employ our ambition, during long years of concentrated vigilance and persevering toil, are less worthy of our endeavors and less precious in the possession, than one single particle of sanctifying grace. Yet, let us suppose that a momentary temptation has assailed us, and we have resisted it, or that we have lifted up our hearts for an instant in faith and love to God, or that for the sake of Christ we have done some trifling unselfish thing, scarcely has the action escaped us before then and instantly the heavens have opened invisibly, and the force of Heaven, the participation of the Divine nature, the beauty, power, and marvel of sanctifying grace, has passed in viewless flight and with insensible ingress into our soul. There is not the delay of one instant. Moreover, these ingresses of grace are beyond number, and yet, if we correspond and persevere, the influence and result of each of them is simply eternal. Each additional degree of sanctifying grace represents and secures an additional degree of glory in Heaven, if only we correspond thereto, and persevere unto the end. At the moment in which we receive each additional degree of sanctifying grace our soul is clothed before God in a new and glorious beauty which a moment ago it had not got. “No temptation has overtaken you that is not common to man. God is faithful, and he will not let you be tempted beyond your strength, but with the temptation will also provide the way of escape, that you may be able to endure it” (1 Cor 10:13 RSV). Let us not be too downcast about our temptations. By resisting them with courage – and even cheerfulness – we are gaining (as Faber points out) many graces for ourselves, and giving glory to our Father in Heaven. What wonderful graces we gain by resisting temptation – they are, indeed, the raw material of our future glory! 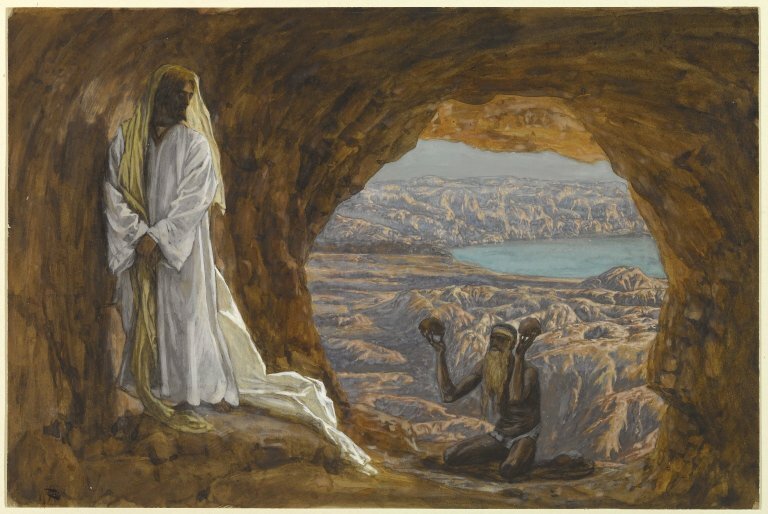 Image: Jesus Tempted in the Wilderness by James Tissot, around 1886, Public Domain, U.S.A.
References: This note is primarily an adaptation of and is drawn from Chapter 16, “Temptations,” in Father Faber’s book, Growth in Holiness; and The Creator and the Creature (F.W. Faber). Thank you Tom Mulcahy for another wonderful article. God bless you always.